So far I must admit to being a fan of Greg Carslaw's game design. His concepts may be a bit bonkers but whether it's programming robots to fire monkeys into space in 404 or a game that manages to replicate the stress of a nightmare, there's a feeling that great ideas are born of madness. 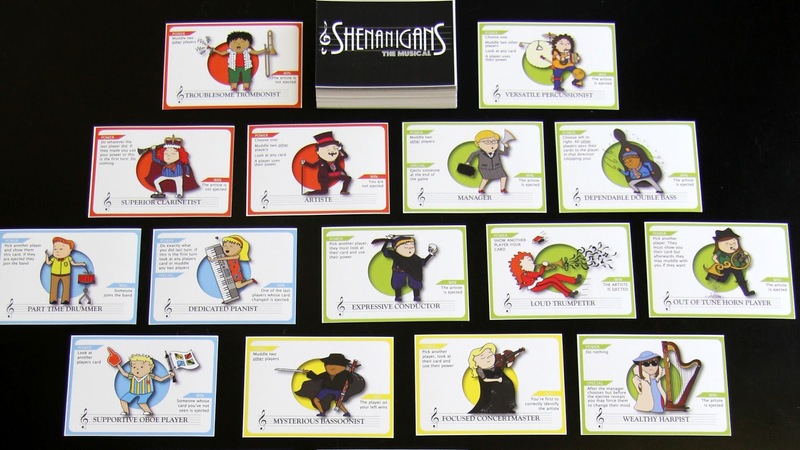 But I'm struggling a little with Shenanigans the Musical, the latest game from Greg that is currently on Kickstarter, and I think it's because it's the most conventional game that Greg has created so far. Shenanigans is a light hidden role and deduction party game. You are all members of an orchestra, along with your classical instrument of choice, but one player is the artiste, who is obviously a pompous prick as another player is the Manager and their job is eject the Artiste from the orchestra. 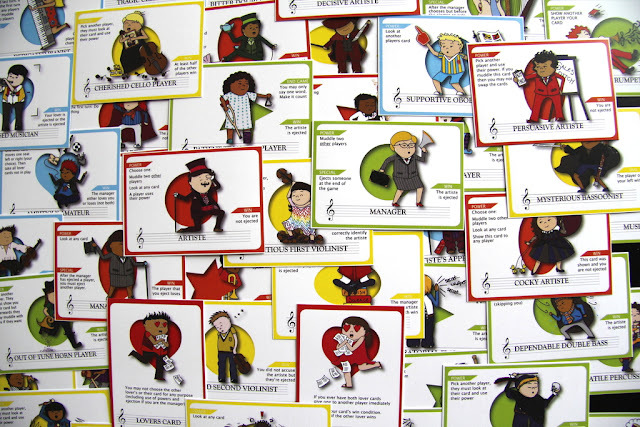 The game is played over three rounds, in the first and third round you will look at your card and activate its special ability, which could be looking at another player's card, getting another player to use their power or muddle. Muddle is the concept of taking two cards and secretly choosing which card to give back to their owner, you know if you have swapped the card but the other players round the table do not. In the second round every player muddles, effectively causing complete chaos as cards get moved around nearly all the players. The third round is a repeat of the first and at the end everyone looks at their card, the Manager reveals and then she has to choose which player is ejected. Now this is where Shenanigans comes to life. Every player has an objective, their way of winning the game, and many rely on them influencing the manager's choice. It's the point where everyone gets to throw accusations, bribe or threaten the manager and move suspicion to the right character. It's the social interaction that turns Shenanigans from a simple mechanism to a party game. Unfortunately I have a few problems with Shenanigans and the main one is the second round of the game. Unless you have an absolutely eidetic memory, or are just plain lucky, no one will have any idea where any card is at the end of the second round. It almost makes the first round pointless, I say almost, as the roles other than Manager and Artiste are changed each game and dealt randomly, so the first round does give players the opportunity to see which orchestra members are in play. However this also means that the first two rounds can be removed by simply having a crib sheet but this would defy the simple, play anywhere aspect of the game. The second issue I had was mainly with the concept, core to the game is you're not allowed to look at your card until you can activate its power, but everyone wants to look at their card as soon as they've been given it. Several games got ruined as players looked at their card mid-muddle. However it does work. With ridiculous amounts of muddling you would think that no-one would have any idea about where the Artiste is but due to everyone being encouraged to chip in with the discussion at the last stage of the game the Artiste does get identified enough to show it’s not just luck. 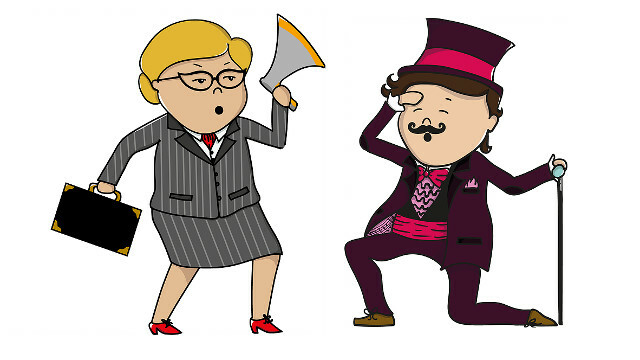 The discussion can range to gentle persuasion to full on shouting, at the end of the game is what make it because a single player simply won’t have enough information to deduce who holds the Artiste. As such it relies on an animated and vocal playing group. I can't deny that we had a lot of fun playing Shenanigans. It's a game that cannot be taken seriously and that's exactly how we played it. Sometimes it felt like we were laughing at the game rather than with it, due to ludicrous situations that player powers created but we were laughing and even though the game has its failings and this is surely the whole point.